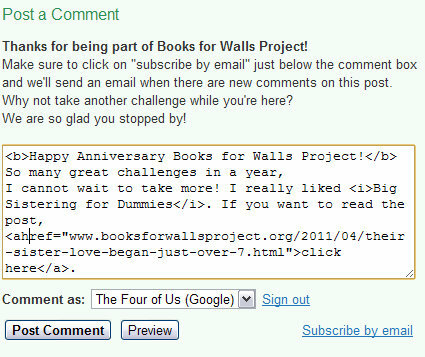 The Books for Walls Project is definitely about books. But did you know the project is also an effort to help The Four of Us learn about the internet, website management and all about blogging? Oh, have we learned a lot in this last year! just follow these simple directions! I Love Books! And The Books for Walls Project! Don't forget to come back on Wednesday for the latest Challenge! any omissions or errors, let us know! Thank you thank you thank you! It works! And when I clicked on preview, Blogger caught a mistake, so I corrected it!!!!!!!!! I love learning new little html tips & tricks. I only just recently (in the last 30 days) finally learned the 'how' to the aforementioned tips! 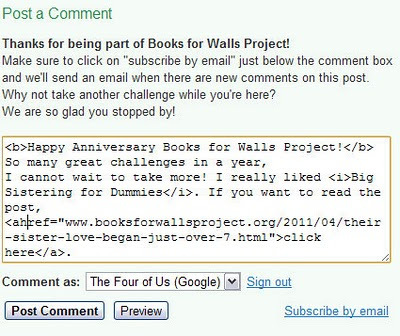 Thank you Books for Walls, for helping me stay savvy with my blogging! Now, if only I could do it as regularly as you all do!?! NEWS FLASH! SERVER DOWN! The Four of Us internet server is down. The Weekly challenge is coming once the service is back up! The Mom wanted you to know, dear readers!